Looking at fashion today, he felt a nostalgia for some of the formal and informal clothing over time and tried to imagine how to bring back some of the features of the past, when men, in particular, used only pocket watches, not only to read the time, but more so as a sign of distinction, nobility and fashion trend. Putting his pen to paper, he designed his first U-BOAT pocket watch. 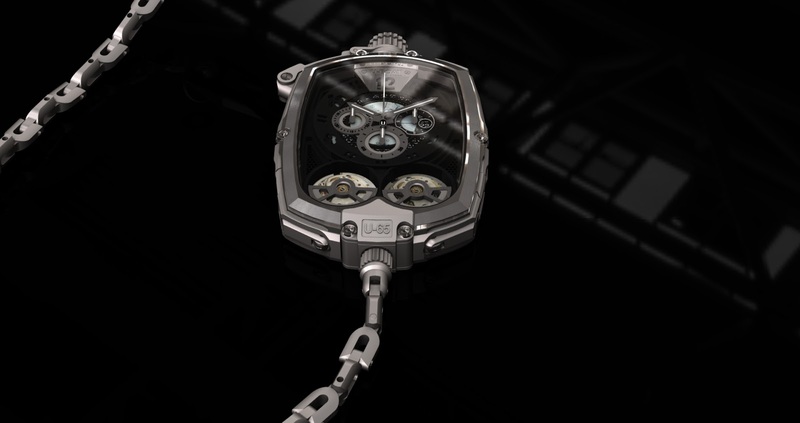 Futuristic watch, the U-65 is the well-realized attempt to transform a classic of the 16th century, in something completely new in design, in line with the times and boasting a strong timeless recognized U-BOAT identity. It represents a good compromise between functionality, fashion and design. This timepiece features timeless design, with 3 time zones, using titanium, where every single part, from the particular screws to the fastening devices, has its own feature and purpose, albeit decorative at the same time. Limited edition at 99 pieces only, a time reading device for the fashion conscious connoisseurs of our time. 3 time zones given by 3 ETA-manufactured movements, two 2671 movements and a 7750 movement, all with top grade finishing and exclusive 925 silver rotor. Chain fastening by exclusive bayonet system with assisted action and safetyblock. Retractable 2671 adjustment crowns and release system with 2 side safety buttons. 7750 crown extraction facilitated by a lever near the chrono buttons. Case, bezel, back and chain made from grade 5 aircraft quality titanium. Accessory components made from AISI 315 I steel. 2 profiled sapphire glasses, 2 mm thick. 140 total components in case (excluding movements). 78 components in chain. 3-level 7750 dial with CNC machined components. 2-level 2671 dials. Total Case Weight: 210 gr. Total Chain + Snap-Hook Weight: 45 gr.